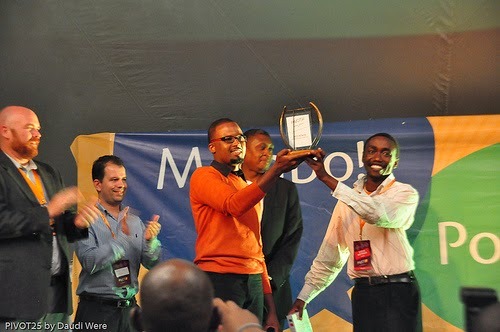 Since 2011, the m:lab has organised PIVOT East - an annual competition for mobile startups in East Africa. Much has evolved about the competition since the inaugural edition was held as PIVOT 25. Some of the evolutions were aptly captured by Nicholas Friederici, a World Bank consultant then documenting the Tech ecosystem in East Africa in this article. One incremental improvement that PIVOT East continues to emphasize on is for participants to regard the competition as a platform for organizational development and business model refinement. Inasmuch as few participants may still see it as one of the many competitions where they could “earn” prize money, there’s many that are getting the geist of the matter and are taking their businesses more seriously with competitions. In the 2013 edition of PIVOT East, market traction was emphasized in the criteria for all selection stages. This helped to minimize the so called “compe-preneur” effect. Market traction included earning or growing revenue, increased active user base, and other growth metrics. Selection criteria in the competition will continue to emphasize market traction. Team composition has been another criteria item emphasized in the 2012 and 2013 competitions. In 2014, strength of individual skills among team members, the complementarity of team skills sets, and members' long term commitment to the teams will matter even more. Many investors will tell you that a bad idea can be improved or killed altogether to take up another better idea. Ideas are cheap and generally worth nothing, unless they are executed into revenue-earning and growing businesses. Often times, especially among “Compe-preneurs”, the execution teams' skills are shallow as focus is more on the idea and the all well elaborated planned business plan. For a startup, the “coolness” of the idea and sticking to the initial elaborate plan A will not necessarily bring revenue and growth.The team has to speedily iterate from the plan A to a plan that works. As Ash Maurya would advise, 66% of successful companies reported drastic changes in their original plans along the way. To execute a great idea into a viable high growth business, calibre of the team is important. If an investor invests in a bad team, they are trapped in a suboptimal investment, difficult to get out of without upsetting the founding team set up. A badly set up team is a hindrance to the kind of efficient, focused execution that a startup requires in the search for a repeatable and scalable business model. Skills sets and experience of designated team members for key roles in a startup matter much. Many a times startups designate key roles to team members that are not fit for the tasks. Founders should strive to co-found with the best talent in the market that brings on board certain key skills to the startup. These could be technical developer skills, design or UI/UX skills or business development. This is because good talent can be rare and expensive to hire later on in the startup. Founders should avoid co-opting each other into a startup without vetting each others’ skills and the experience each brings on board. More importantly though, founders should be honest enough with themselves to recognize a skills gap arising as a going concern to fill it with the right talent while offering strong incentives such as stocks, an interesting culture and or a noble mission. The later it is in the life of startup this gap is recognized the less likely it would be for stocks, culture and mission to beat instant cash remuneration as the motivation for new talent. The product of a Tech startup is not merely the technical solution. Its the overall business model which in the lean canvas representation includes 8 other components. To build a product that customers pay for, a startup requires collective team ability to understand and deal with customer segments and their pains, acquisition channels, revenue and cost structures among other key business model components besides “coding” the solution. 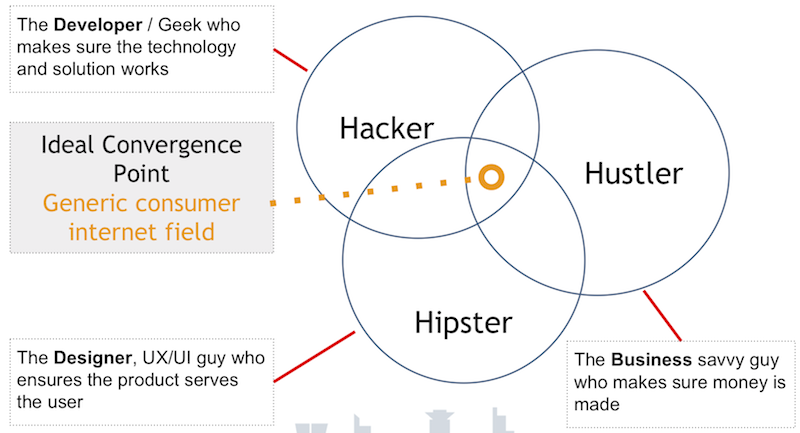 Dream Team of The Hacker, Hustler and the Hipster? Many Tech startup teams over-emphasise the role of the Tech co-founder, so much so that they simply constitute as, say three developers (hackers) assigning each other roles such as CMO, COO, CFO and CTO. The same happens where business founder (hustler) underestimates the need for a Tech co-founder. In such cases the “hustler” ends up with arrangements where the hacker is a consultant or a temporary employee - often engaged only to build the first prototype. In PIVOT East we have seen comic cases such as the loosely engaged developer disappearing with the code for a prototype that calls urgently for iteration. Besides having a hacker and a hustler in the mix of skills sets, importance of the user experience (UX) designer (the hipster) is often underestimated by startups. This currently occurs among startups in East Africa and is partially attributed to the general scarcity of such skills in the Tech community. For many consumer driven internet solutions, user experience is a big differentiator. Attracting the best talent among user experience designers (often converts from graphics design) to be a co-founder may be the clever-most decision in a startup. For startups seeking to disrupt or impact specialised domains such as health, education, agriculture and engineering, the importance of a domain expert in the founding team is very important. Recently I asked Jamila Abass - CEO of Mfarm what was one thing she would do differently if we rewound the clock by two-three years. Quite profoundly, her answer was something like “I would co-opt people with agriculture domain expertise in the team the earliest possible”. The importance of domain expertise in the founding team is demonstrated by some domain specific startups in East Africa such as Eneza Education. The startup has a founder, Toni Maraviglia who is a career teacher by profession. Having deep understanding of market setups, domain technical skills and other domain specific intricacies helps startups to speedily navigate around challenges and opportunities in the domain. The emerging success story of Eneza education is partly if not significantly attributed to the domain knowledge infused by Toni in the startup. As an experiment, we have set Inclusion of a domain expert in startups in specialised domains of the new mobile impact ventures program at m:lab East Africa a requirement. We anticipate good results especially with respect to appreciation of customer insights. Apart from having super skills deployed for required areas of expertise and having complementary teams, inherent interests among team members matters. Commitment level for a super talented team member engaged as a temporary consultant is not as inspiring as a super talented team member who is a co-founder with significant stock allocation in the startup. To investors, business partners and even customers, there’s more confidence in the future of the product when key team members have demonstrable long term commitment. It may be that consultants and employees on contract may be the most practical way to deploy certain high caliber skills required. In fact its the default scenario for most mature corporate organizations. For a startup which mostly has constrained resources, it appears wise to sell the vision to key talented members that remain in the team with stock incentives rather than paying fat consultancy-like paychecks on a on occasional basis. A challenge may arise for founders in convincing the right talented people with the right attitude to join the startup - besides having to convince them to take small paychecks in the “short term”. In this case its worth considering founder / employee recruitment as an investor pitching exercise. Besides investing time and skills to the startup among other opportunity costs, the new team member has to invest psychological commitment to the startup’s vision. That way the team collectively builds the right culture, attitude and agility towards achieving the startup’s mission. Vesting agreements help founders and investors to secure commitment from key personnel (especially founders) to the mission and course of the startup for the long term - usually four years. A typical founder vesting schedule is incorporated in a founders agreement or the shareholders agreement. If you search hard for lawyers around tech hubs in East Africa you will find lawyers that could help structure one. This is not to say that startup lawyers are easy to find in the region. The vesting agreement is very much like founders giving back their shares so that they can earn them over the time the company stabilises towards its vision actualisation. For instance, a typical challenge appears when 9 months down the line after the startup is founded, one co-founder wants to leave. It could be for “good” reasons such as “business co-founder gets a green card to canada or another country”. The prospect of moving to a land of “milk and honey” with a stable n-figure salaried job can be too compelling to ignore. The question then would be; Do they relinquish stock worth 9 months of extraordinarily hard work or do they move over to Canada with their entire stock allocated to them even though they haven’t quite worked for its entirety? Thus, on [END DATE] (the "Full Vesting Date"), each Founder will be 100% vested. Very often when investors suggest to introduce or re-set vesting schedules for key talent (especially founders) in a startup, its demonised as one of “vulture capitalists” way of short changing founders. It may be different if understood from the perspective of a vision sold by the founders that only they can pursue to fruition. However, whether revising vesting schedules based on an investment deal is fair to startups or not is irrelevant in this post. Vesting agreements seem to be an important instrument to demonstrate long term commitment among founders and even among employees that have stocks or options. Startups in East Africa should be encouraged to embrace vesting agreements among founders and employees. This is because securing talent in a region where entrepreneurship and startups are a second option is JUST HARD - considering the prospect of better paying jobs coming up is always hanging over the heads of key personnel. With good vesting agreements among startup teams, it should be easy for startups to demonstrate their mission commitment to investors. This is an aspect that PIVOT East organizers in 2014 will be watching out for.